To Sum It Up: Vampires are just part of the population of New Whitby, Maine, but Mel Duan has never been fond of them. Her best friend Cathy, however, finds them fascinating and is smitten with Francis Duvarney, the new vampire student at school. Mel does not approve in the least, and she’s determined to prove to Cathy that there is nothing at all desirable about a vampire’s way of life. 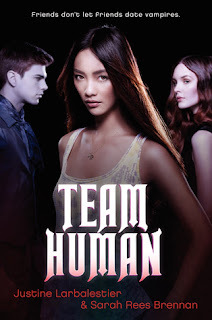 Review: This month marks six years since I first read a little novel about vampires called Twilight, so I chose a pretty apt time to pick up and read Team Human, which takes a very tongue-in-cheek approach to our fanged friends. If you’ve read any vampire book at all, not necessarily Twilight, you’ll still appreciate the plentiful humor in Team Human that mostly targets all things vampiric. I’d seen multiple reviews that mentioned how hee-larious this book is, and I’d like to add to the chorus. Francis, the new vampire arrival at school, is old (if you count back to when he was transformed), old-fashioned, and has a penchant for speaking in an old-timey manner. I couldn’t help but think of another fictional teenage vampire whenever Francis appeared on the page, and I also couldn’t help cracking up at the spoof here. Francis isn’t the main character, however; that would be Mel, best friend to the human girl who falls for Francis and vice versa. To say that Mel does not like Francis or vampires in general is an understatement. She vehemently opposes the budding relationship between him and her best friend Cathy and makes her disdain for Francis very obvious. Although some of Mel’s wisecracks are a riot (she refers to Francis as an “undead love weasel”) and her protectiveness of her friends, especially Cathy, is undeniable, Mel’s methods for helping her friends can be heavy-handed at times. I thought that some of her actions in the name of keeping Cathy from getting hurt were more meddlesome than beneficial to Cathy. Mel does get called out when she goes too far, but that wouldn’t be necessary if she didn’t overstep boundaries in the first place. I still have mixed feelings towards Mel; I really liked her wicked sense of humor but was far less keen on her overbearing side. With Team Human being very much a plot-driven novel, most of the characters aren’t overly complex. Kit, a character whom I found endearing straightaway, was a notable exception. His backstory is quite interesting, and he’s also quite witty, especially when the subject is Francis (poor Francis). Even six years after Twilight, I still haven’t grown weary of reading about vampires, and Team Human was an enjoyable vampire parody. All in All: Recommended for anyone looking for a vampire book that doesn’t take itself too seriously.